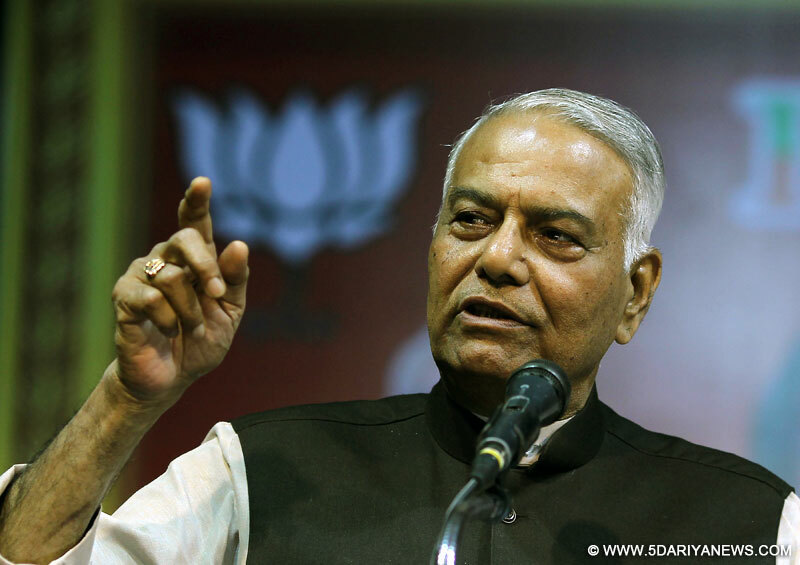 Senior BJP leader Yashwant Sinha, who has criticised the BJP leadership in recent times, says he is with the central government on the JNU row. At the same time, Sinha also said in an interview that Prime Minister Narendra Modi should not have visited Lahore on December 25 to greet his Pakistani counterpart Nawaz Sharif.Sinha, who has been critical of the working style of Modi and BJP president Amit Shah, however told IANS that he supported the government's action vis-a-vis the JNU issue. "On this, I am with the government. Anti-India activities can't be tolerated and stringent action must be taken against the culprits. Be it JNU or any other university or any part of the country, it should not be allowed to be a hub for anti-national activities," he added.Sinha, a former finance and external affairs minister, came down heavily on the Congress for politicising the row. "Whatever happened at the JNU campus was totally wrong," he said, referring to the February 9 meeting on Kashmir where anti-India slogans were raised. "The government took the right action. And when it acted tough, the Congress started its politics. "Sinha also accused the Congress of creating hurdles for the Modi government. "Be it FTII or Hyderabad or JNU... After its (Congress') debacle in the Lok Sabha polls, there are some elements in the country which want this government not to work freely. "Whenever they get an opportunity, they create hurdles for the Modi government. "Sinha flayed the Congress for demanding proof from Home Minister Rajnath Singh that the JNU incident had the support of Pakistani terrorist Hafiz Saeed. "Who are they to demand proof? Should he (Rajnath) show proof at India Gate or Vijay Chowk?" Sinha said, adding the country must believe what the home minister says.Sinha, however, made his opposition known to Modi's dramatic visit to Lahore on his way back to India from Afghanistan. "I don't agree with the way Modi suddenly visited Pakistan in his effort to have good relations with them. We have seen the results of such efforts during (Atal Bihari) Vajpayee's time." At Lahore, Modi and Sharif pledged to pursue the peace process. The meeting was followed by an attack on an IAF base in Pathankot in Punjab by Pakistani terrorists. "He (Modi) doesn't need to again reinvent the wheel. India should deal very cautiously with Pakistan and should only try to maintain its relationship. I am of the clear view that India should not engage with Pakistan further as it will not benefit us. "Sinha added: "India should not have any structured dialogue with Pakistan. Be it composite or comprehensive. We don't need any such dialogue. "I don't mean India should go for war. Neither do I mean we should close our High Commission in Pakistan. "I mean to say India should not begin any structured dialogue with Pakistan as it is not going to benefit (us). "Sinha, whose son is the Minister of State for Finance Jayant Sinha, said all efforts to have a dialogue with Pakistan would be in vain till it agreed to discuss cross-border terrorism. "We want to discuss the issue of terrorism but Pakistan wants Kashmir on the table. Till date, there is no agreement between the two countries. So, how will the talks proceed? "Sinha refused to compare Modi with Vajpayee, saying he has no experience of working with Modi. "I am not a part of the Modi government. So how can I compare the working style of the two leaders? "Sinha refused to take questions on Amit Shah. "Will not comment anything on Amit Shah... I will not even hear your question... If you take his name, I will...," Sinha responded, when asked about the BJP president.